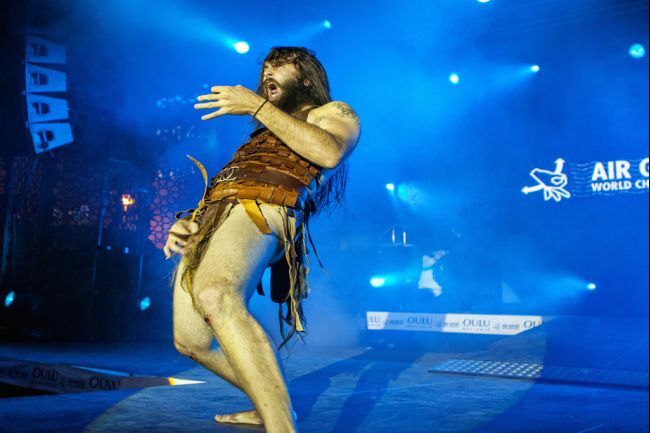 Home Tags Posts tagged with "air guitar world championship"
Justin Howard, also known as “Nordic Thunder”, has won the 17th annual Air Guitar World Championship in northern Finland. Dressed in a leather Viking outfit, Justin Howard narrowly beat his rival “Aristotle”, or Matt Burns from New York. Dutchman Theun de Jong finished third in the competition, which has been held in the Finnish city of Oulu since 1996. The 18 finalists included competitors from Japan, Britain, Russia, Czech Republic and Estonia. “Nordic Thunder” Justin Howard reportedly gave an “energetic” performance, sliding across the stage bare-legged, and won with a total of 34.6 points to Matt Burns’ 34.4. Air guitarists will usually perform a 60-second solo performance with an imaginary guitar-like instrument. They are marked on their technical prowess and stage presence, with competitors jumping, sliding and crowd diving to impress the judges. Finland hosts a number of unusual events, including an international mobile phone throwing contest and wife carrying.